Review: “Stoker” was directed by the cult filmmaker Park Chan-wook, becoming in his first film to be made outside South Korea. The result is one of his best works in a decade. Dropping the sanguinary cruelty of “Oldboy” or "The Vengeance Trilogy", Chan-wook should continue to please his fans by means of a psychological violence filled with attitude and gloominess. 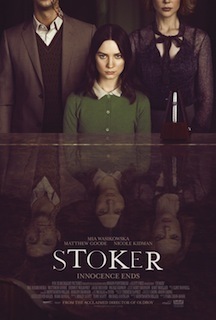 “Stoker” evinces the morbidity of “Harold and Maude” without the joyful moments or the happy ending. Instead, it embarks in a path of sensuality and deadly coldness. Mia Masikowska has here one of her best performances as India Stoker, a lugubrious girl, whose father died in strange circumstances. Right after her father's funeral, the mysterious newcomer uncle Charlie (Matthew Goode) invites himself to stay with the family. His presence will have a strange effect in his niece, rousing innermost feelings that were hidden in secrecy. This sinister tale about a cursed family might leave you dazzled with its uncomfortable moments of malevolent hostility. Written by Wentworth Miller, actor in the television series Prison Break, “Stoker” revealed to be a catchy and consistent thriller.